We are a coveted business organization engaged in catering to the variegated requirements of the customers by bringing forth durable Wall Cladding Roofing Sheet. The offered range of products is designed by our vendors after researching on various advanced technicalities that are apt to facilitate clients in their concerned industry applications. Mostly customers preferred to purchase quality products, so we are involved in providing Cladding Roofing Sheet. 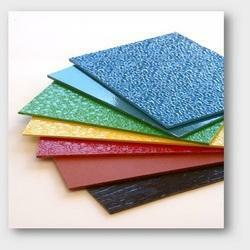 We are successfully engaged in providing a wide gamut of Cladding Sheets. Relying on our expertise in this domain, we are into offering Aluminum Cladding Sheet. We offer ACP cladding that is largely used in offices, factories, shopping malls, hospitals etc. High quality aluminium is used in making of such products, which we obtain from Alucobond, Aludecor, Alomax and other branded organizations. As per the demands of our clients, we also fabricate ACP cladding and comprise a sort of specialization in offering best services to our clients.